This is a Collection of Corsets that has been influenced by and adapted from historical designs for fit as well as design. I have created these corsets to be worn as bodices that can be worn a myriad of ways. They can be worn with various skirts to form a gown or cocktail dress. Or, you can mix up the look and wear them with pants or jeans and have some fun with them! These corsets can be made from your choice of various embroideries, silks, brocades, trims and laces. You can choose a lace-up back (this gives you the ability to manipulate the figure the best) or hook-up back which gives a clean finish. If you are a “corset person” you will love this collection and it’s possibilities. Speak with us about what can be made just for you! 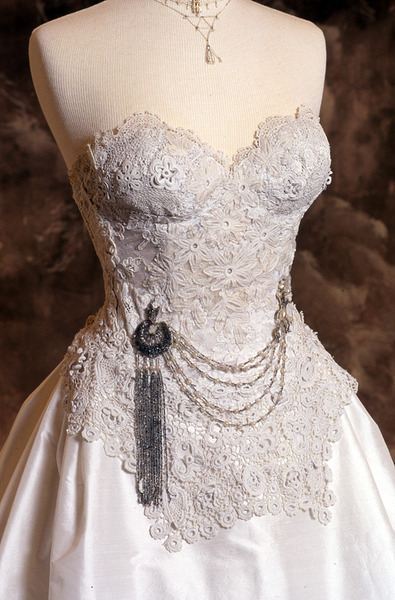 This is an example of the lace collage corset I can do for you for a special order. I use a combination of new and vintage laces from England and France. I work directly with the client in showing you the laces I have on hand and developing a beautiful custom made corset for you!